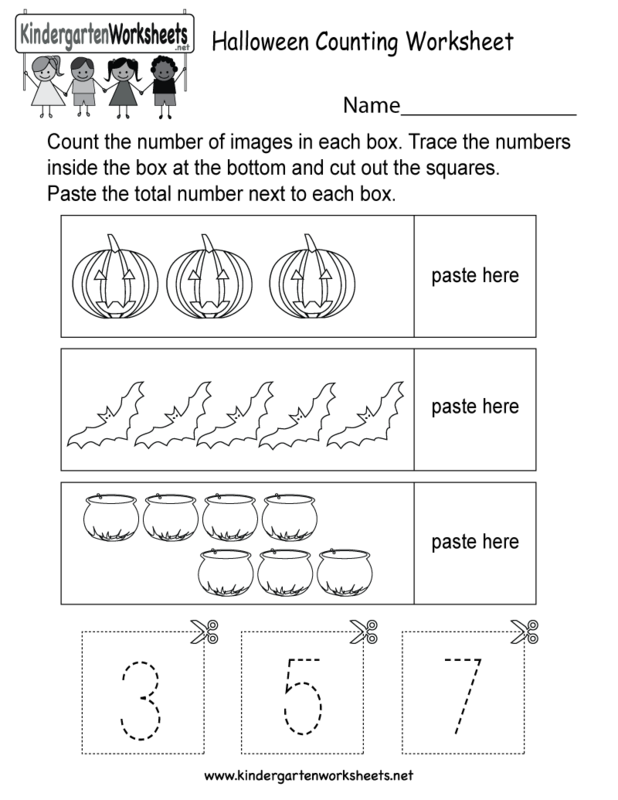 Kids can count Halloween-themed images, practice tracing numbers, and improve their fine motor skills by cutting out numbers in this free kindergarten worksheet. This free holiday worksheet can be used three ways. Kindergartners, teachers, and parents who homeschool their kids can print, download, or use the free Halloween worksheet online. There are three icons above the free Halloween counting worksheet. The first is labeled "Download" which will prompt you to download the PDF version of this kindergarten worksheet. Printing the PDF of this holiday worksheet will produce the best results. The second icon is labeled "Print". Selecting this will take you to another web page that only has the Halloween counting worksheet so that you can print the worksheet inside of your browser. The third icon is labeled "Online". This will take you to our kindergarten web app where you complete the Halloween worksheet using your computer, iPad, or other tablet device.